Early on a sunny morning, we drove south out of Amsterdam towards the village of Lisse, where we would find Keukenhof Gardens. Shortly after getting settled into our hotel room, we rented bicycles at the hotel for a self-guided tour of the massive fields of tulips in the area. 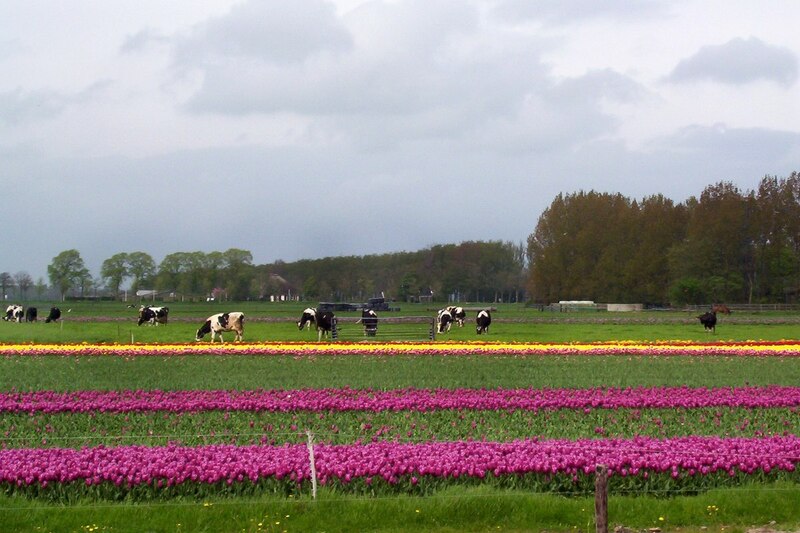 Endless bike trails weave around the tulip fields and through the villages. 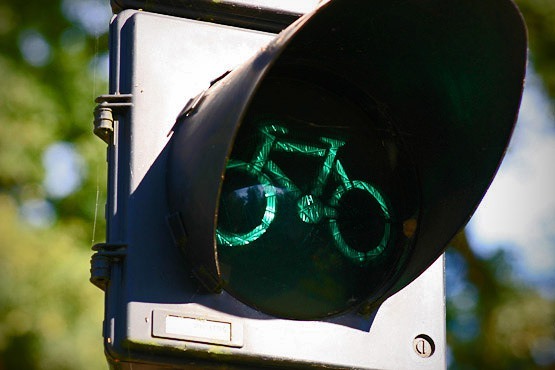 The extensive system of bike trails features overpasses and underpasses for the cyclists and a separate series of traffic lights. Being regular cyclists at home in Canada, it was a real treat to be in a world where bicycles have their own trail system (highway) with intersections and traffic lights, even out in the countryside. And yes, we even saw bike policemen keeping tabs on people. We were graced with an unusually warm day, 25 Celsius, that made our tour of the tulip fields and farm country all that much more enjoyable. 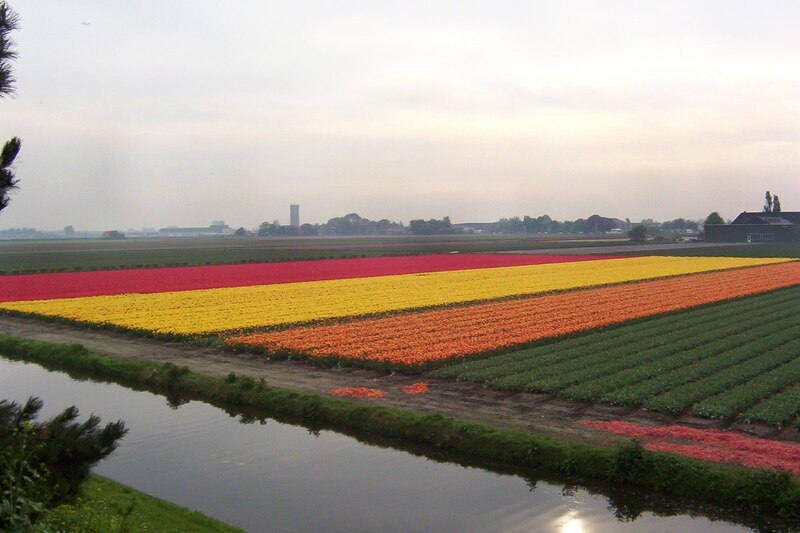 I always knew that The Netherlands (Holland) was well known for its tulips, but it wasn’t until I saw the endless fields of blooms in every color of the rainbow that I realized just how extensive that industry is in Holland. As I learned on this trip, there are many different varieties of tulips. 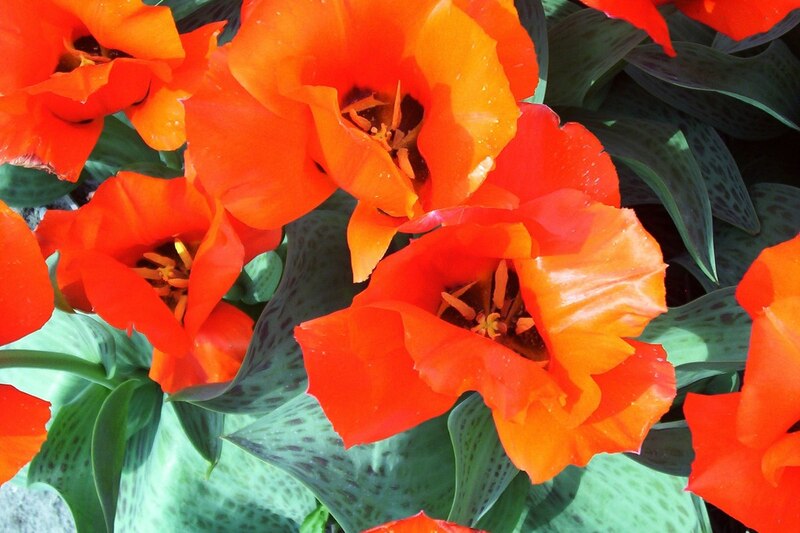 The Royal Horticultural Association of Holland has grouped them into 16 official divisions, which include everything from single early tulips to fringed tulips, Rembrandt Tulips, Parrot Tulips, and Fosteriana Tulips like those in this picture. 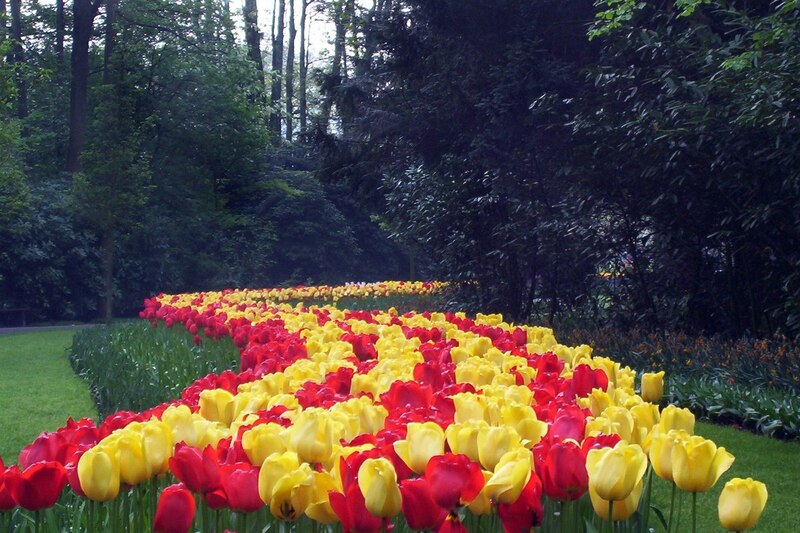 To see and learn more about all the various types of tulips, visit the Royal Horticultural Association of Holland. In Canada, Dutch tulips put on an impressive display every spring in my country’s capital of Ottawa. The reason the Dutch tulips are in Ottawa is because, during the Second World War, Canada actually provided a safe haven in Ottawa for the Dutch Royal Family to live. 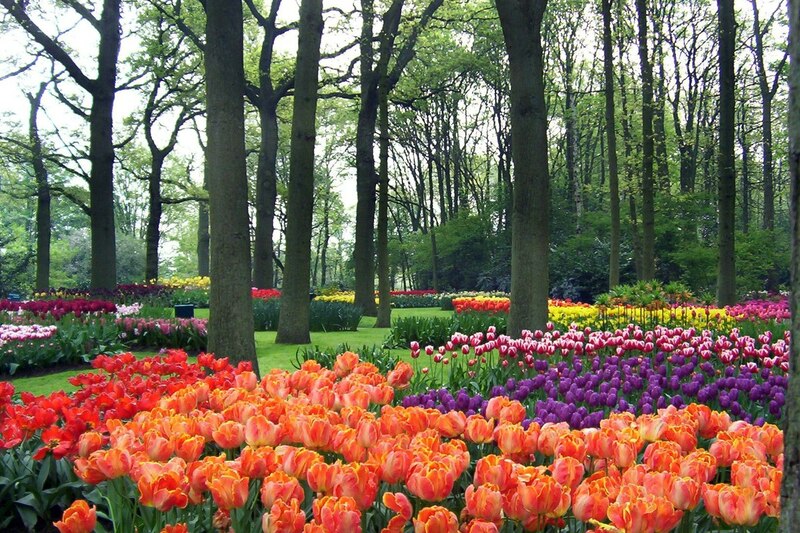 After the war, the Dutch Royal Family and the people of The Netherlands sent thousands of tulip bulbs to Canada as a thank you for that kindness. Today, that tribute continues. 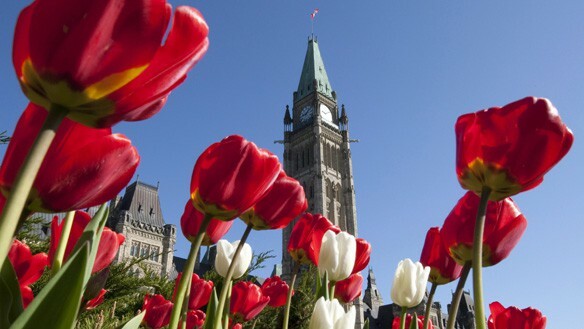 Each spring, thousands of Dutch tulips bloom in Ottawa, continuing the show of thanks. 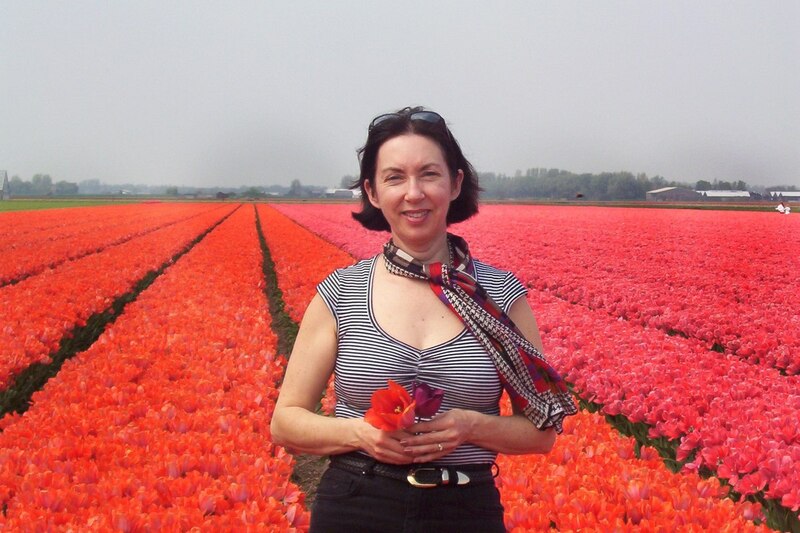 While riding our bikes, Bob and I passed by innumerable fields of vibrantly colored tulips. 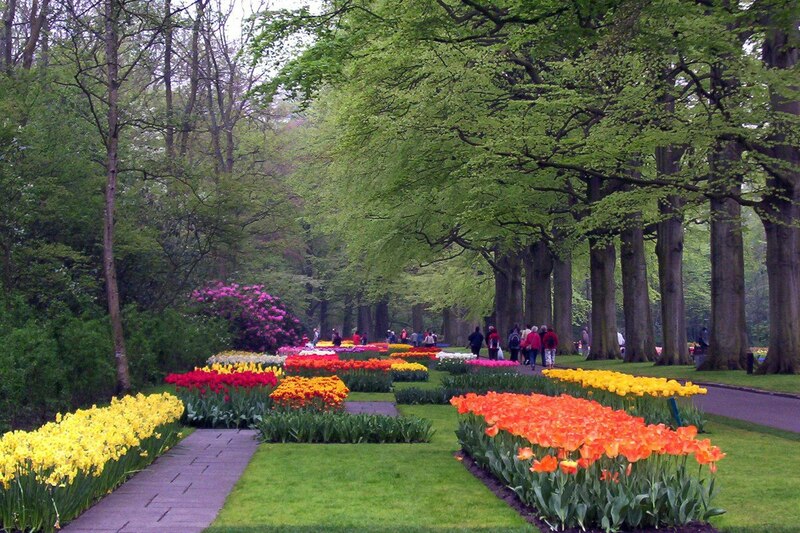 We traveled to Holland in mid-April when the tulips are usually at their best. 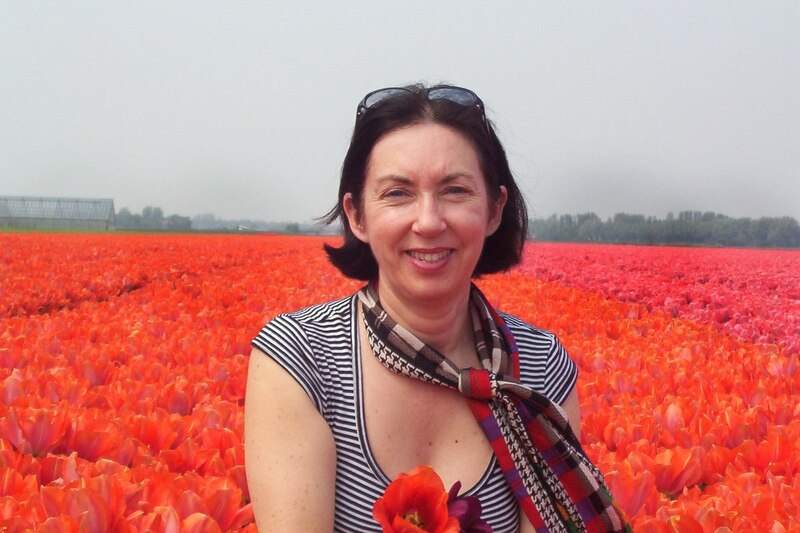 Each field was a sea of color resulting from millions of tulip bulbs. 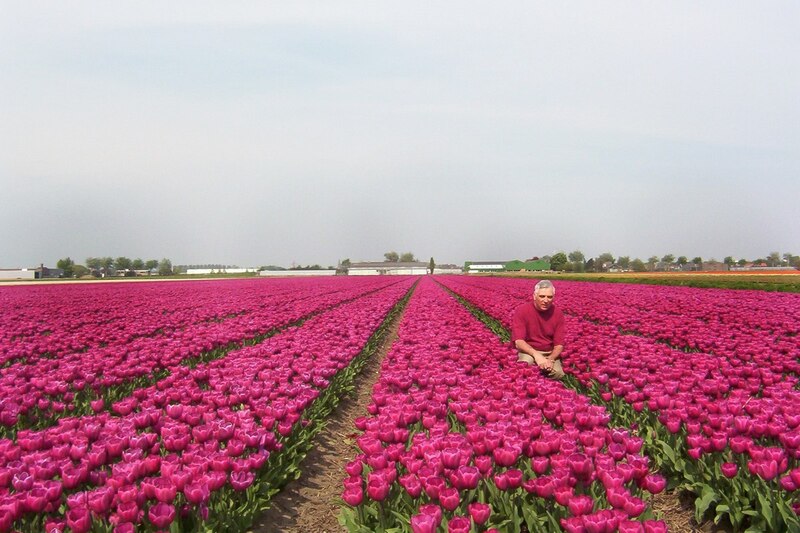 Here, we see Bob lost in a sea of pink in a growing field near Lisse. 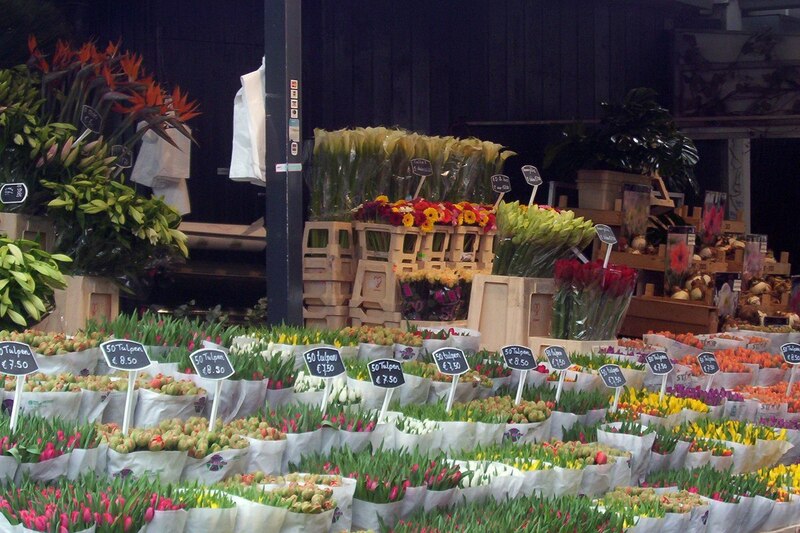 No surprise that there are so many tulips for sale in The Netherlands, a fact that makes the country the world’s biggest supplier of these popular springtime flowers. 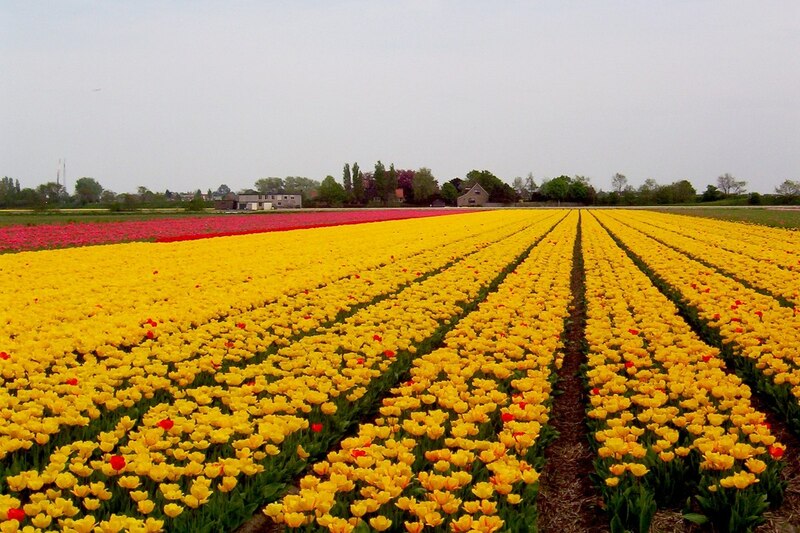 Although this is not the Golden Age of the Tulip (1600’s), Holland, today, still produces over 8 billion blooms, worth billions of dollars, each year. Tons of people were out enjoying the weather and scenery. People had even come with their campers, which they parked between the narrow roads and the canals bordering the tulip fields. 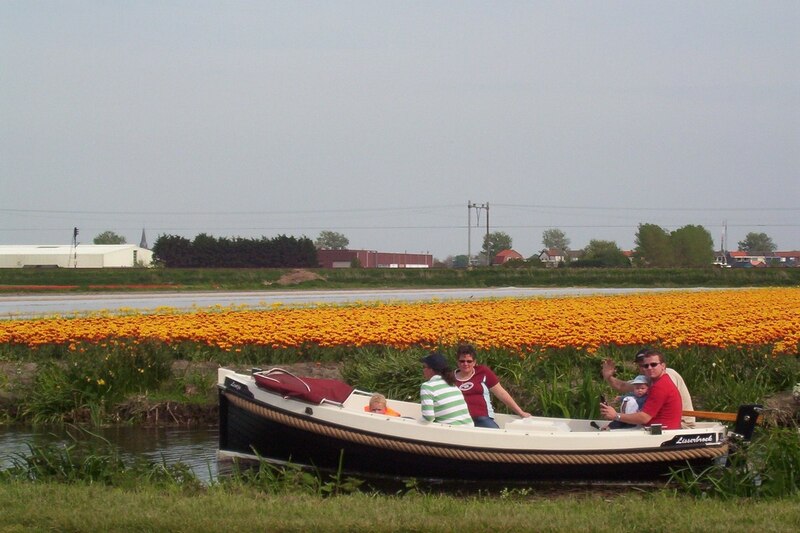 Children were seen swimming in the canals, but they had to be mindful of other sightseers plying the canals by boat to get an even closer look at the flowers! The Dutch love of tulips is often referred to as “tulip mania”, and the Golden Age of Tulips is called the “Dutch Golden Age”. In 1637, one single tulip bulb sold for more than 10 times the yearly income of a skilled craftsman. Today, we live in an era when stock markets collapse in a flash; just think back to 2008. Well, back in 1619, the world market decided to dump metal coins, and to buy tulip bulbs to fund a war. In 1622, the tulip bulb market burst, and the world’s first recorded economic collapse occurred. 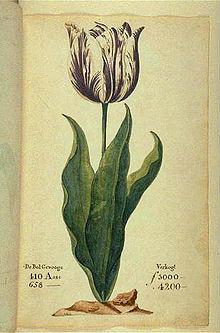 It was all based upon a flower, and so “tulip mania”. A moment of pause in a bed of tulips. And, no, I didn’t pick that flower. It was lying idle in one of the rows. After our day of cycling through the growing fields near Lisse, we laid plans to cycle to Keukenhof Gardens early the next morning. We arose at 6 a.m. in order to arrive at the front gates when they opened for business. Thankfully, the gardens were devoid of people. Only the occasional gardener was seen nipping off expired tulip heads or gathering up the dropped petals. 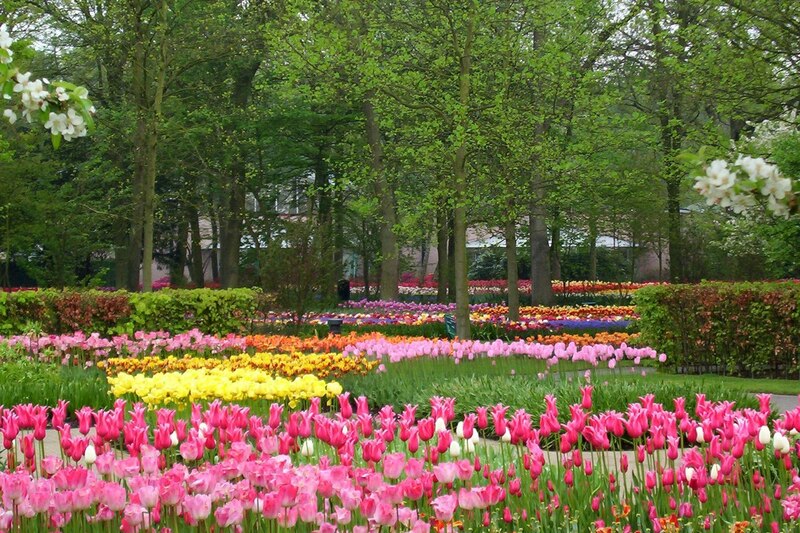 Panoramic views of never-ending beds of tulips spread in all directions, and the countless varieties and endless shades of color resulted in constant stimulation for the senses. 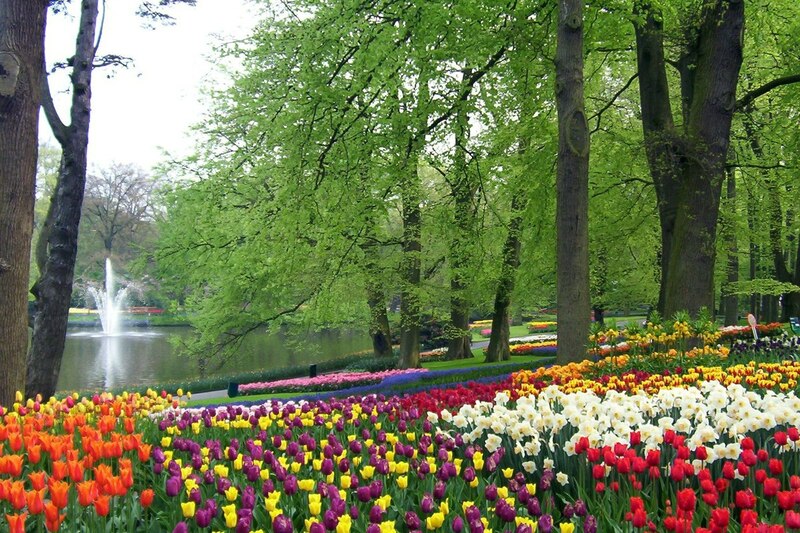 It’s probably worth noting that, if you are thinking of traveling to Holland, Keukenhof Gardens will be open to the public next spring from March 21, 2013 until May 20, 2013. Seven million tulip bulbs have already been planted!!! 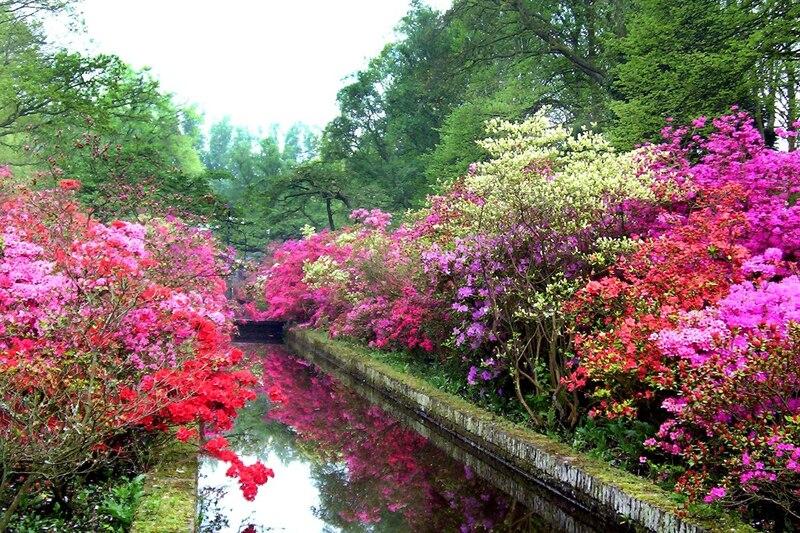 Hoping to give fellow gardeners pause for reflection, Keukenhof has created seven Inspirational Gardens, everything from Historical Gardens to Forest Gardens, and Ornamental Gardens around ponds like this one. A wave of red and yellow leading off into the distance. 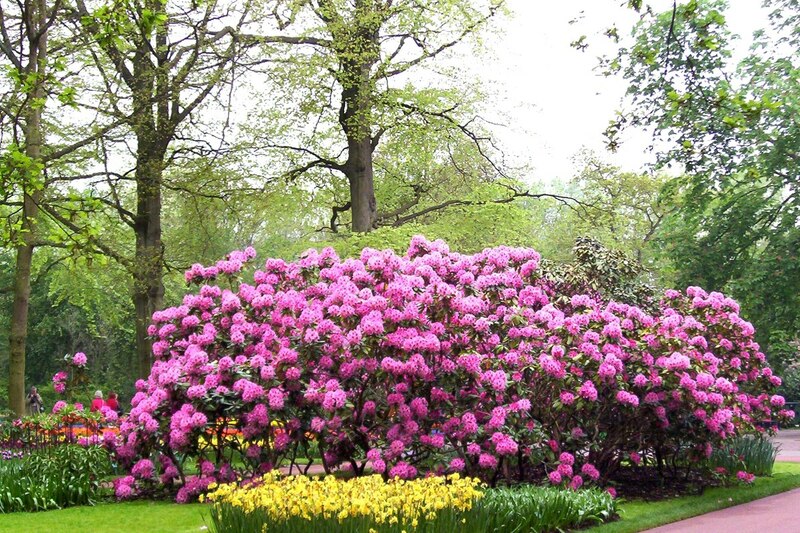 In addition to tulips, the gardens at Keukenhof also feature contrasting beds of fritalleria, hyacinths, narcissus, azaleas and rhododendrons, overhung in many cases by flowering fruit trees. Reflecting pools, waterfalls and fountains add interest, and streams flow musically throughout the gardens, sometimes leading to an unexpected pond where swans floated effortlessly amidst the colourful reflections. 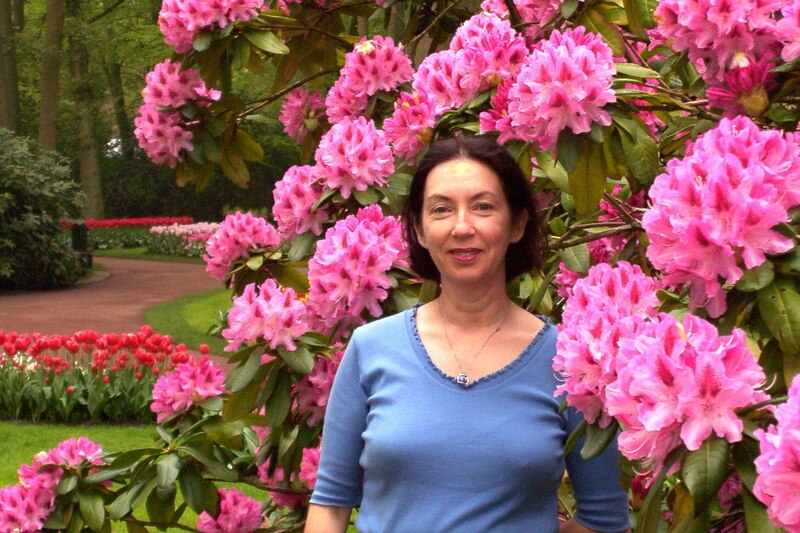 Although the rhododendrons were spectacularly beautiful, their size paled in comparison to those we saw in Ireland on a different trip. 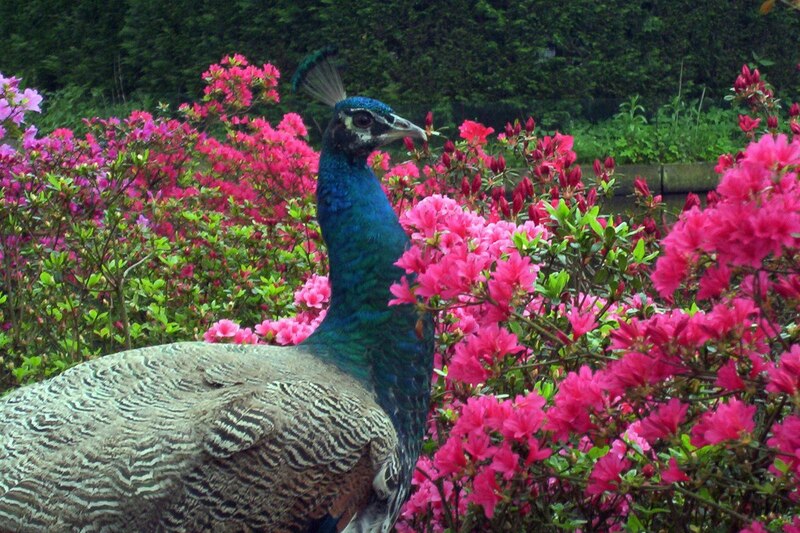 Now if only my own rhododendron had flower heads this large. I can only dream about that! 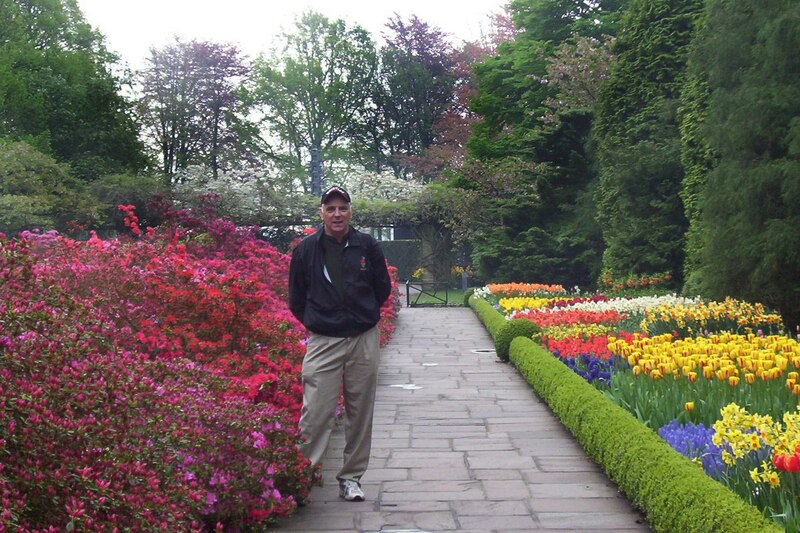 Bob poses amongst the showy display of flowering plants. Bob and I casually wandered along the pathways as more tourists began to arrive. The available sunlight and resulting shadows really added to our photo compositions. We nicely completed one circuit of Keukenhof Gardens before the sky darkened down, and the next thing you know, it began to rain. 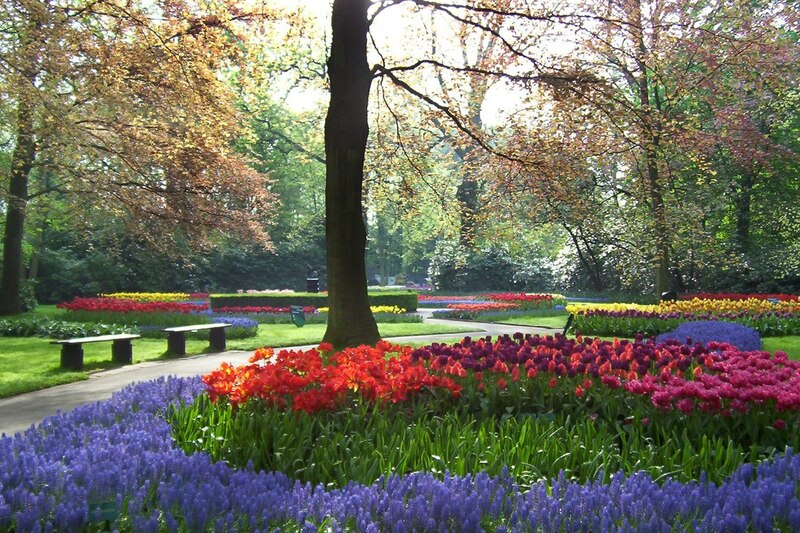 Keukenhof Gardens opens yet again from: March 23, 2017 to May 21, 2017. Open from 8.00 to 18.00 daily. 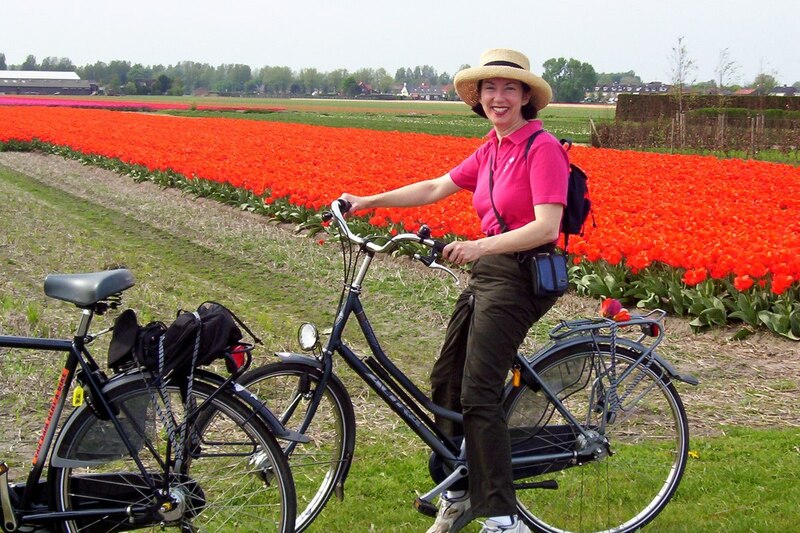 Bob & Jean, good to read that you both enjoyed so much your cyclingtour through the Holland tulip fields. Next time you come to Lisse, just get in contact with me. I am a professional guide who knows every inch of this area and love to show ‘strangers’ around and in the meantime also tell the amazing story about the Holland bulbindustry. A real discoverytour! Thanks for your kind offer, Herman. 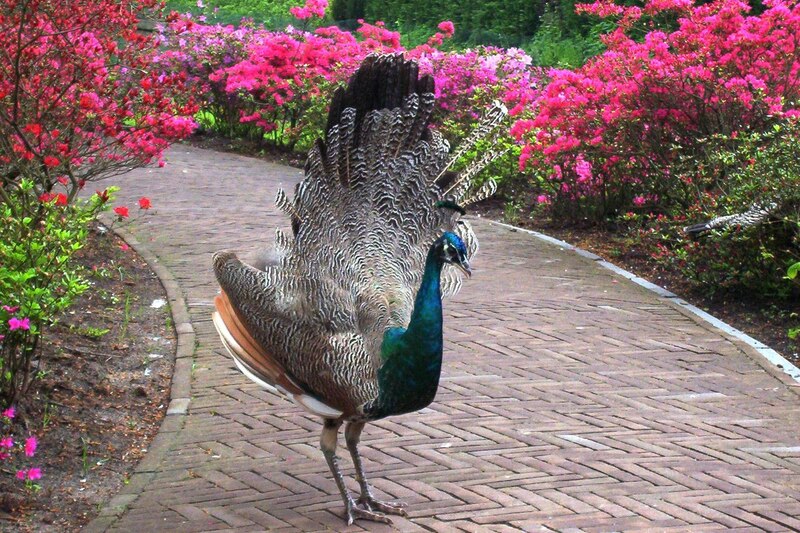 Indeed, Bob and I would like to return to Holland another time to enjoy once again the magnificent display of spring-blooming flowers, in particular, of course, the tulips. 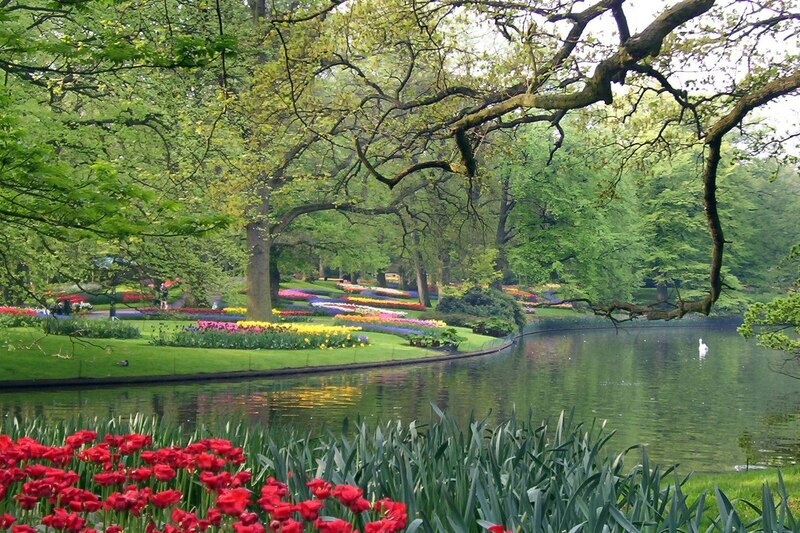 It is pretty hard to beat the impressive spreads seen at Keukenhof Gardens and the surrounding fields. Thank you for the helpful tips! Can I just ask about the tulips in July? Are they still good as they are in april? Hi Maressa. Tulips are spring-blooming flowers so they would be finished by July, but do not despair. 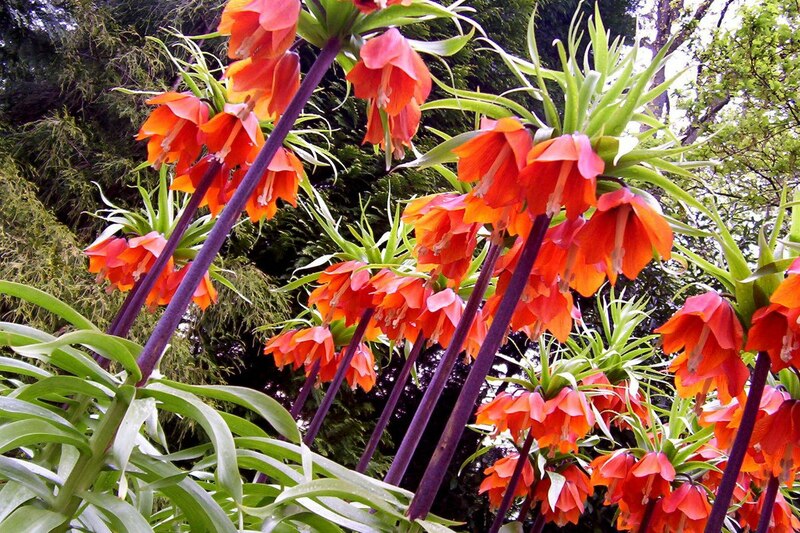 The gardens would be filled with beautiful seasonal flowers during the summer months. thanks! We were blown away by the sea of blooms.